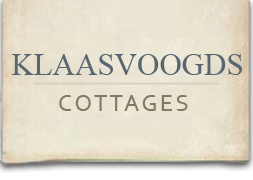 Klaasvoogds Cottages (Klaasvoogds Opstal which sleeps four and Klaasvoogds Cottage which sleeps two to three) offer charming, luxurious self-catering holiday accommodation and is well-equipped for long stays. Both the cottages lie in the beautiful Klaasvoogds Valley, at the foot of the Langeberg Mountains and have lovely views of vineyards, mountains and orchards. Klaasvoogds is centrally located in the Robertson wine valley on Route 62, within easy reach of many places of interest. The nearest towns are Robertson and the quaint, Klein Karoo town of Montagu, which has to be one of the prettiest towns in South Africa with its mix of vineyards, orchards and beautiful heritage buildings.